Posted on July 11, 2018 . 6 Comments. In this 2nd episode of “StrongFirst,” the official podcast of the StrongFirst School of Strength, hosts Craig Marker and Scott Iardella interview Brett Jones, Chief SFG Instructor and Director of Education at StrongFirst. 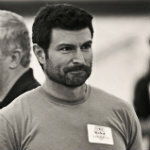 Brett has been teaching kettlebells for over 15 years. He discusses the principles of strength, and how it applies to the kettlebell, barbell, and bodyweight exercises. 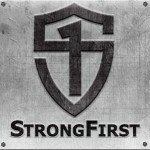 01:51 – Brett Jones’ job at StrongFirst is Chief SFG Instructor and Director of Education. 02:52 – Bodyweight courses are about how you manipulate your bodyweight and your leverages. 06:17 – “Power to the People” book by Pavel Tsatsouline became key reading to Brett. 08:04 – Move well enough to adapt to the stresses your body will be placed under when training. 11:09 – The kettlebell is good for moves like get-ups, presses, swings, and snatches. 22:28 – Brett’s training with 10 sets of one kettlebell swings. 27:50 – The tools and skills are scaled and customized to the individual. 32:59 – Nothing replaces having a personal trainer. 34:25 – Proper programming should have you recovering from your training. 40:17 – Plan Strong is a graduate-level course in programming—as intensity goes up, volume goes down. 44:50 –Brett is reading the “The Spinning Magnet” book. 49:10 – There is a plethora of videos, forum community support, articles, instructors, and courses available on the StrongFirst website. ARTICLE: The Perfect Kettlebell Swing: Is There Such a Thing? Craig Marker, Ph.D., Senior Instructor, CSCS, is a fitness enthusiast who has spent his life trying to help people improve their lives. As a professor, he works with students on how best to understand research and place it into context. He has published over fifty articles, chapters, and textbooks on psychology and research methods. Great Podcast full of good info. Keep going guys! This podcast reaffirms why I am at S1 and have adopted these training principles and plan to help others do the same. Thanks to Brett, Scott and Craig for doing this. Thanks guys. Keep doing these shows. Yes! I have been waiting for this! Great introduction episodes, lot’s of material and questions, Love it! Cannot wait to hear more. I am so glad you guys are expanding, and doing this type of stuff, it helps immensely, and gives new and exciting direction, for those of us that have to wait to get to a course. That was great thank you Brett, Mark and Scott. Very interesting can’t wait for the next one.